“The way to a man’s heart is through his stomach.” There is no way we can deny the fact that having a good meal makes us very happy. It’s time to spread happiness with Hawkins pressure cooker. If you don’t have one then there’s no better time than now to get on with the affordable Hawkins pressure cooker price. Not only it is efficient, safe, less time and energy consuming, but you can also show your versatility with this multi-purpose pot. Cooking for few people is easy, but now cooking for more would also need just the same effort. Now we can happily say “more the merrier” without thinking about steaming yourself in the kitchen heat. hard anodised body with stainless steel lid. 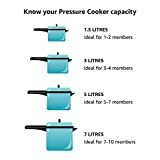 Hawkins pressure cooker is one of the top brands in the market at affordable price. You can get yours today!